Out of all the people who've gotten a bad rap through the ages, witches have probably had it the worst. First, it was the witch hunts, that was real rough. They had to keep their cauldrons hidden and made sure no one was looking when they turned into a black cat. After non-magic people realized what happened at Salem was probably a mistake witches were almost forgotten about, they totally didn't mind. Then Hollywood came along and landed that house on the witch with the cool sparkly shoes and called the witch of the west wicked, a house had just crushed her sister. To add insult to injury they gave her warts and the green skin. Things turned around after Bewitched started playing on television. Now, witches are feeling free to live openly and start having fun. These days witches have been spotted skipping rope in quiet neighborhoods they were never seen in before. They have a love of hopscotch and jacks, things they didn't feel comfortable doing during the witch hunt days. Their favorite new sport, recently discovered, is broomball. 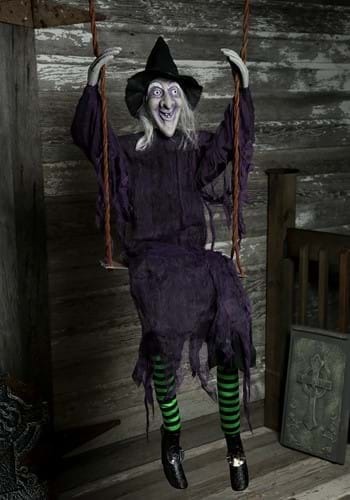 To stand with those fun loving witches invite this swinging witch to your house this Halloween. She's purple, she's festive, and she's ready to hang. After all this time turns out, witches just want to have fun.